We’ll be doing a series of safety centric posts, all while trying not to be too preachy. This first post examines the safety attitudes of recreational racers. Little research exists on the current safety culture for the auto racing industry, both amateur and professional. Aviation has guiding documents & philosophies, like CRM, that mandate things like rest. But for us, best judgment is what is at play for how long and hard we race. There is no regulation saying you need 12 hours of crew rest or any guidance on time between “bottle to throttle”. Additionally, the temperature is already hot, triple digits in the summer. Couple that with hot cars and any additional safety equipment one may be wearing and the thermal burden is high, and so is the potential for fatigue. 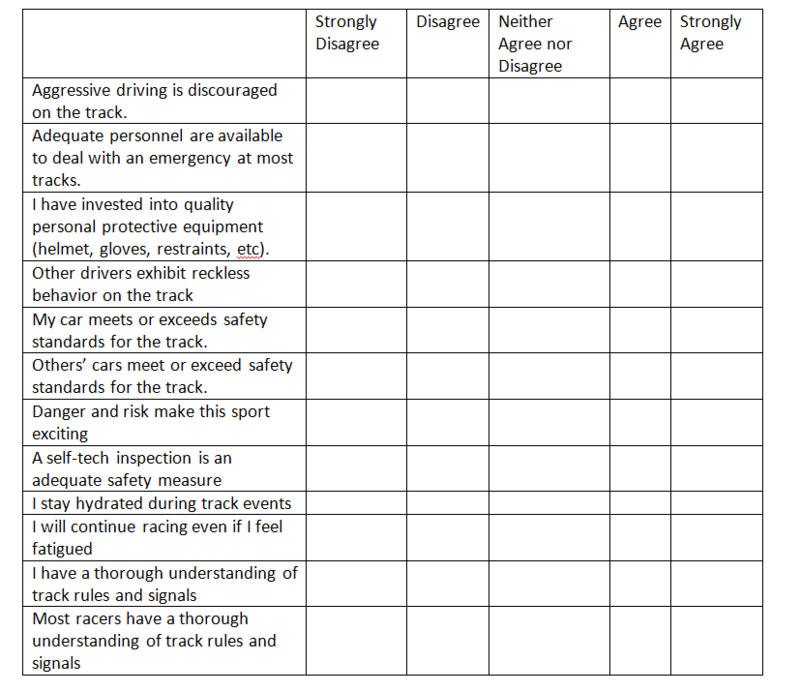 Mentally, there are many track rules and signals to be aware of, what other cars are doing, and one’s own performance. Put simply —racing is physically and mentally demanding. The events are full day, sometimes extending into the night. Not to mention any work that may need to be done on a car after a test day, getting ready for a race day. Cognitive demands of remembering track rules and signals, while maintaining situation awareness of own vehicle and other vehicles. Well, 60% surveyed agreed danger and risk make the driving exciting. Perhaps it’s all those other hooptie cars out there spicing it up for the rest of us in our perceived safe cars. Everyone surveyed said they stay well hydrated during track events. That’s awesome. But, a potential confound is that this track company provides free water at events. Would it be the same if they didn’t? 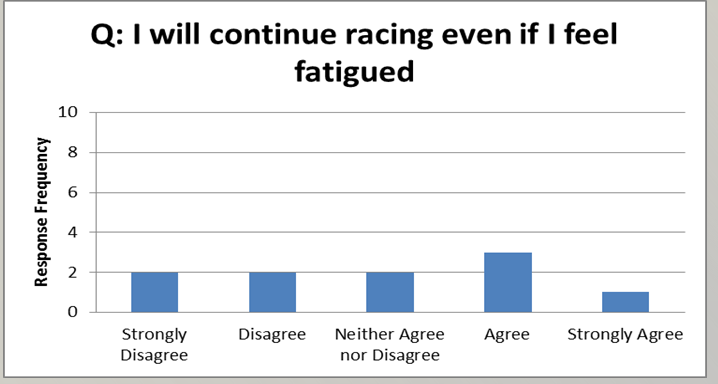 Responses to the fatigue question were split; 40% disagreed they would continue racing, and 40% agreed they would race even if fatigued. While all participants agreed they thoroughly understand track rules and signals, only 30% of participants agreed that others had a thorough understanding. Probably those bastards driving those hooptie subpar cars out there again who don’t know the signals. But seriously, the math doesn’t add up. There’s a misperception of ourselves or others. It’s likely a combination of both. Because the sleep question was a fill in response, many people responded with a range. For those responses, all values in the range were plotted. Q: Have you ever had an accident (damages >$500)? Q: How regularly do you eat? Answers were categorized into fast food or healthy food; 70% of participants ate fast food and 30% ate healthy food. Q: How far do you typically drive? The response for this varied because no track was specified, but on average participants drove approximately 100 miles to get to the track. So, what can we get out of this very limited survey?It seems that overall, people take care of their cars and their protective equipment, but there may be a large room for improvement for taking care of oneself in other ways (sleep, nutrition, fatigue). One of the cheapest ways to make some quick safety improvements at the track could be as simple as getting an hour more of sleep, or grabbing a decently healthy snack. Be smart and stay safe! This entry was posted in Safety and tagged fatigue, human performance, performance, safety, safety series, track safety. Bookmark the permalink.